The Common Lot is an open collective of people dedicated to working together to produce relevant, high quality, original theatre that can be enjoyed by all. Director Simon Floyd believes a democratic approach is ‘the only way to make art’ and human connection should be at the heart of creating meaningful work. By, with and for the ‘ordinary folk’ of Norwich, the projects facilitate participants to generate research material, artistic content and deliver production. Everyone must benefit. This is the inherent fuel to a project. They ask, how can we help you and how can you help us? From practitioners learning to become more democratic in how they create art to participants learning new skills. Simon describes it as “Everyone rowing the boat for their own reason. It doesn’t matter what that reason is – we stretch our arms around them”. All contributions are freely given and equally valued. This is the spirit in which something is given and the spirit of the gift is kept alive by constant donation. Contributions are “Given freely, without thought of selfish return, which allows for a collective idea”. They don’t quantify contributions, from organising a tour or being a stage manager to making tea, everyone’s offerings are valued. We have what we need; and if we don’t, we can find it. The collective find themselves “rich in resources experience and good will to others”. They prefer to value people, brains, time, resources and connections. Simon tells a lovely story of a project he worked on in Burnham Norton where a group wanted to line the village paths with lights. By not having the money to buy lights, they asked around and a local potter came forward, donating lots of wonderful handmade pots filled with tea lights. He describes the moment as “absolutely beautiful and even more beautiful as they were made by a local artist”. Based on these values, each project then goes through a transition of research, response and realisation. They are heavily grounded in place, evoking specific areas of Norwich or significant moments in history and each project starts with a team of participants undertaking primary historical research, facilitated by a professional researcher. The response phase creates the artistic output in concept form and varies considerably in execution from project to project. This phase may compel a period of development from professional script writers or theatre producers. This is not an absolute approach and for the show ‘All Mouth, No Trousers’, the researchers turn their work into a script, with the professional writers acting as editors, rather than creators. The final production is a work of many hands, and willing volunteers take an active role in all aspects of delivery. Participants may learn carpentry, digital marketing or stage makeup through volunteering and a legacy of new skills is viewed as an essential outcome. Along with this, the projects at large, allow people to be active agents in creating something new. Simon sums it up as “allowing people’s creative impulses and desires, allowing them to play into a bigger piece”. An invitation is opened up for everyone to “participate in an act of creation” where human connection is key. All Mouth, No Trousers: Norfolk’s Radical Women is a recent project of The Common Lot. It is an irreverent and joyful celebration of radical Norfolk women told through story and song. The show draws on the traditions of cabaret, music hall, dramatic monologue and verbatim theatre. You can find out more here. In December they were awarded Heritage Lottery Funding for Anglia Square: A Love Story – a community-built theatre, choir and education project to investigate and celebrate the history of an iconic city landmark, soon to be no more … it was confirmed that Anglia Square will be demolished, so a very timely and poignant project for 2019. 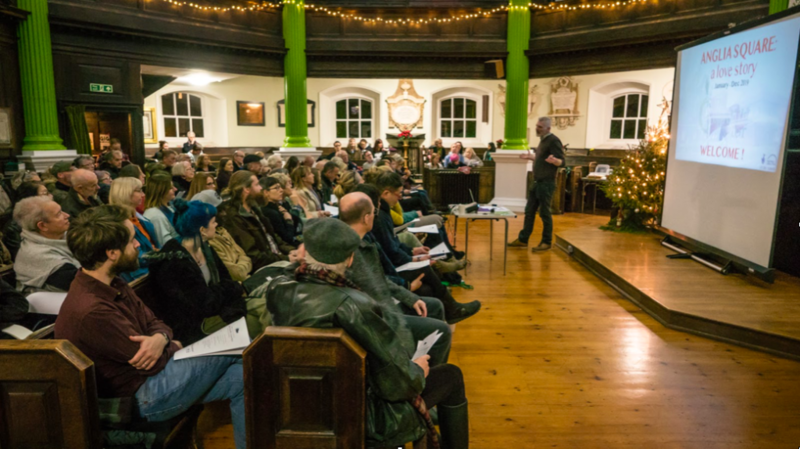 85 people attended their open meeting in December (see photo below). Read more about what’s to come here.